In 2003, the Canadian Association of Independent Living Centres (CAILC) received funding from the National Crime Prevention Partnership Program, Public Safety and Emergency Preparedness Canada for “Crime Prevention and Independent Living; A Pan-Canadian Initiative for People with Disabilities”. CAILC is a non-profit, national bilingual umbrella organization supporting a network of 26 member Centres across Canada to promote the full participation and integration of persons with disabilities. This report provides an overview of key themes that emerged at the National Safety Symposium: Crime Prevention and Independent Living. 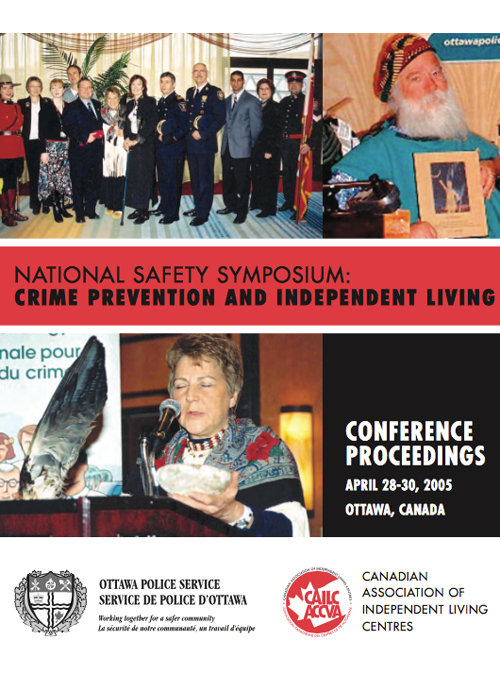 The Symposium was convened and hosted by the Canadian Association of Independent Living Centres (CAILC) and the Ottawa Police Service in Ottawa, April 28–30, 2005.